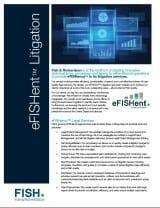 We take pride in delivering the highest quality, most efficient legal services and support possible to our clients, and are pleased to introduce our eFISHent™ Litigation approach. By design, eFISHent Litigation enables us to achieve our clients’ objectives at a price that is an outstanding value – and we do it at all points of litigation. We have the ability to tap into an extraordinary storehouse of knowledge. We’re fluent in virtually every technology imaginable. Our people work seamlessly across offices, bring the best teams together to handle client matters, and leverage the court-specific and local knowledge and talent resident or experienced in key jurisdictions across the United States and abroad. We carefully manage the workflow of our lean teams and maximize the use of technology.